‘A remarkable product that I became competitively addicted to very quickly in the studio’. A quote from our Head of Sport, Ben Peppi, when commenting on Mi Hiepa. 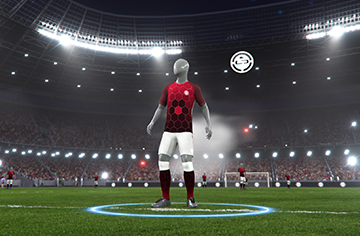 Mi Hiepa are the latest innovative tech company to join Barn Door and we are delighted to present the market leading virtual reality training and cognitive development tool for elite football as our showcase of the month for April. Mi Hiepa has two related but differentiated offerings. Firstly, the Return To Play (RTP) facilitator and secondly, a pathway to the next level of evolution as an athlete at whatever standard of playing. In Return To Play, Mi Hiepa have created a product that removes the current gap between rehabilitation where the use of a ball is not possible and where it is, between rest and training impact. Allowing repeated insight, repetition of best practice and elite performance level preparations, Mi Hiepa could revolutionise the training of elite and amateur elites with a new method of over 25 training drills that allows you to train both body and mind in ways that are not possible in real life. With no need for handheld controllers to move your feet, accuracy and immersion in MHS is unparalleled. The most exciting thing…the team at Mi Hiepa, with elite validation, are in a unique place to be able to switch the product into a consumer product in under two years. To see videos of the product in action, please visit the Mi Hiepa Website here. For more information, please contact directly Ben Peppi using the form.